At Mansion House we do everything we can to prevent decay occurring, but sometimes it does happen. 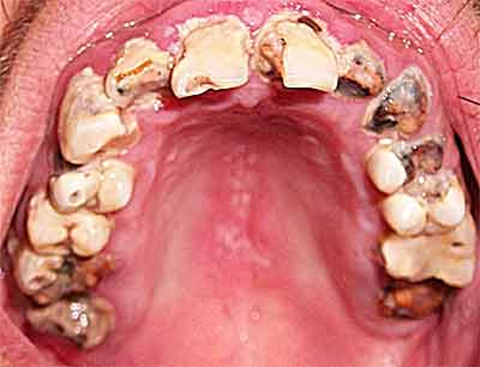 Bacteria on our teeth live on the food we eat, mainly sugars. They thrive in areas of plaque that is not removed. As they consume sugars, they produce acids, which dissolve the enamel of our tooth and start the process of dental decay. If sugars are eaten on a regular basis throughout the day, there are constant acid attacks on our teeth, resulting in extensive decay. Decay can be prevented by limiting the amounts of sugar we consume, and reducing it’s frequency to mealtimes, where at all possible. At mealtimes, your mouth is producing it’s highest amounts of saliva, which acts as a protective buffer against the acid. It can also be prevented, by regular and thorough cleaning, both around and in between your teeth. This removes the plaque where the bacteria thrive, and also the fluoride in toothpaste provides protection against the acid.